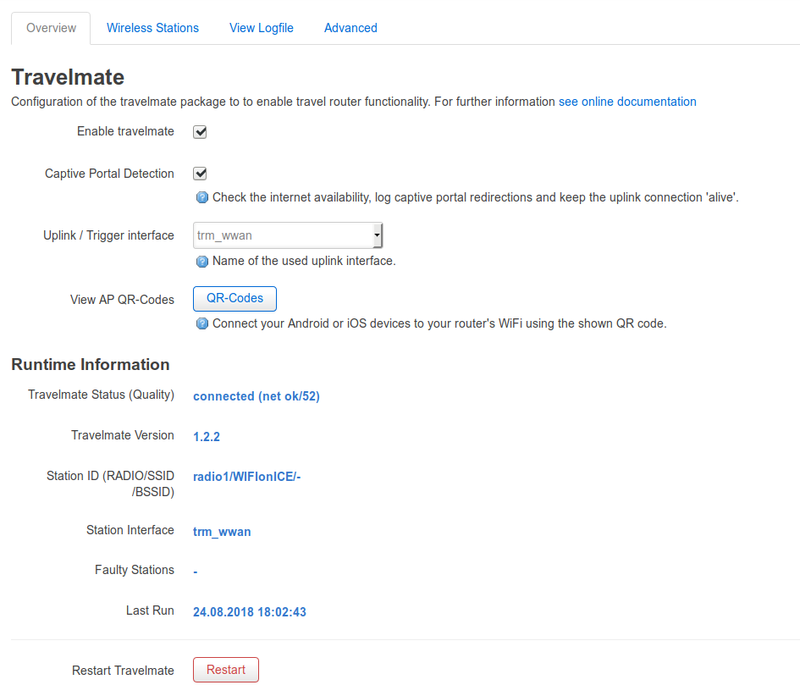 in the OpenWrt stable & snapshot package repo you'll find the travelmate package, a wlan connection manager for travel router. For Luci screenshots see following post. Feel free to test, ask questions or make suggestions. remove the "--spider" download option from captive portal detection to make the heartbeat function more robust. Keep the uplink connection 'alive' with all sorts of portals. remove needless third status "not connected", use only "running / not connected" and "connected"
no longer rename faulty uplinks in /etc/config/wireless, but save uplink state in json runtime information. To reset the saved state simply restart travelmate processing. Are concurrent Client Mode connections possible? Is it possible store a list of SSID for mode WIFI client wan on router? Using device as "Hotspot-Router" (WISP-Mode)? Android WiFi Hotspot as Failback to Cable WAN? Newbie question: how can I broadcast Master SSID if Client SSID not associated? Add (via Scan radioX), change or delete Wireless Uplinks, furthermore you can change the Uplink priority via move up/move down buttons. The currently used Uplink is emphasized in blue. Thanks! This looks great! I have a half dozen devices that this will make more useful and easier to maintain. I have a half dozen devices that this will make more useful and easier to maintain. Thanks for your feedback! It would be nice to know, on which devices (model/chipset) you are using travelmate. My plans are to use it on NEXX WT3020 (MT7620n), A5-V11 (RT5350F) and potentially, some RT5350F-based audio streaming endpoints. Oh, it will probably come in handy on my ZSun Card reader too (AR9331). Not sure when I'll actually get around to trying it out. I have a bunch of other projects competing for my time. I am using travelmate on a Xiaomi MiWiFi Mini. The Xiaomi MiWiFi Mini has some characteristics that make it very usable for my use case, and it is very cheap, only 22 Euro, including shipping from China. I use this router as a travelrouter on a small ship to connect to the WiFi in harbors I visit. It is standing behind the windscreen, mostly in direct sunlight, so the white color prevents it from overheating. It is a dualband router with external antennas. The range is very good (on 2.4 GHz). The 5 GHz is used for the local network. I alse have a guest network, but that is mainly for showing off . 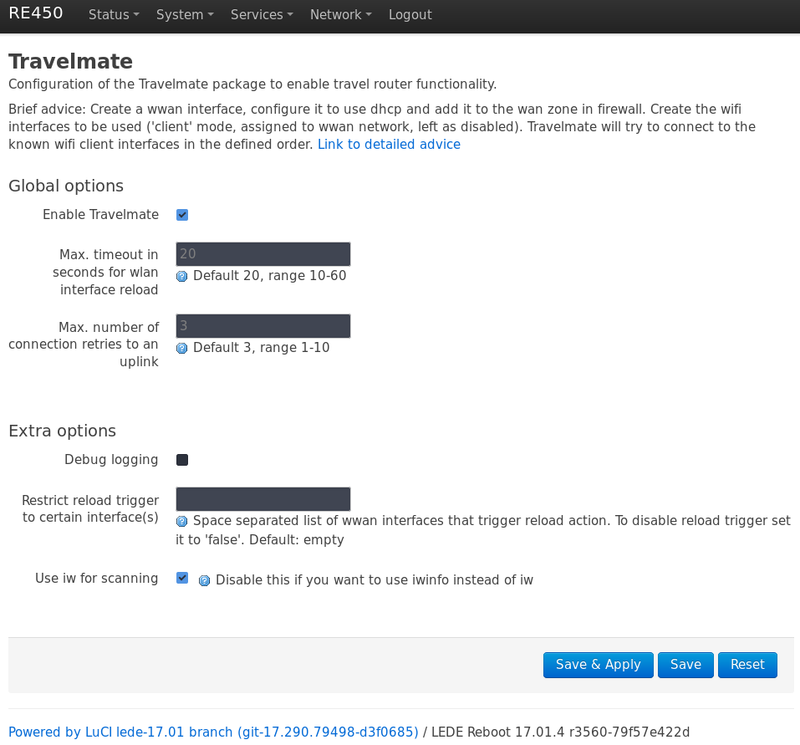 My first experience with travelmate (version 0.4.x) was with a GL-inet GL-AR150-Ext. It worked like a charm and was much more stable than with the software from GL-inet. I then switched to the Xiaomi MiWiFi Mini, because I wanted a little bit more reach (the GL-inet GL-AR150 has only about 63 mW). Travelmate didn't work the way I was expecting with 2 radio's. I contacted Dirk and 3 days (!) later Dirk send me a version that was able to have the AP en the station at different radio's. After that there was only one thing missing in the LuCI-GUI of travelmate: an easy way of adding and editing stations. Before I could contact Dirk about this, version 0.9.0 was released. I have no more wishes. 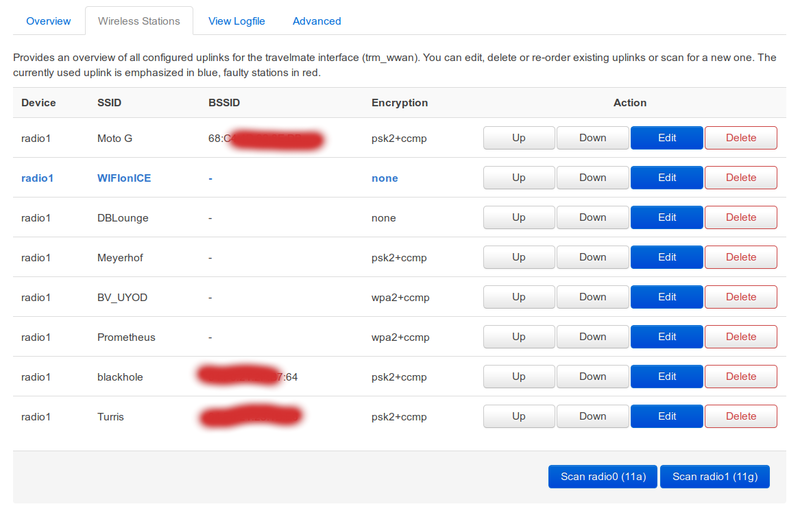 Is it possible to make disabling of misconfigured uplinks optional? Yesterday I left the harbor with my ship, that had an active link with the Wifi in the harbor. At some point the Wifi of the harbor is still visible, but it is no longer posible to maintain the connection. Travelmate renames the uplink to SSID_err. When I return to the harbor travelmate does not reconize the uplink anymore. After renaming the uplink to SSID everything is working again. it's always a pleasure ... ... I think it should be sufficient to raise the Connection Limit (trm_maxretry to 10 or 20). Anyway, in travelmate 0.9.3 you could set the above parameter to '0' which means unlimited retries. Will report after the weekend. Dirk, it works as expected. Can you brick your device installing snapshot packages? Is the wizard I'm looking for hiding somewhere other than Services>Travelmate? EDIT: The manual setup worked perfectly, and I'm very happy. I'm just curious about the wizard. Thank you for this simple to configure, functional tool! EDIT: The manual setup worked perfectly, and I’m very happy. I’m just curious about the wizard. Thank you for this simple to configure, functional tool! Hi, you've installed the old/ancient "stable" release ... to get the wizard and all the advanced LuCI stuff use the download links referenced in the first post of this thread and install it manually via opkg package manager. Oh, whoops. Thanks. Maybe I'll upgrade later then. Kindly anybody help me what's wrong? /usr/lib/lua/luci/dispatcher.lua:433: Failed to execute template dispatcher target for entry '/admin/services/travelmate/stations'. /usr/lib/lua/luci/template.lua:97: Failed to execute template 'travelmate/stations'. Kindly anybody help me what’s wrong? When does this error comes up? If you click on the "Wireless Stations" tab? But I doubt that this will help. Please note: I never tested travelmate with an ancient Chaos Calmer release and I have no device (and no time) for testing. Thanks for testing. I've provided a CC-bugfix with this Pull Request.